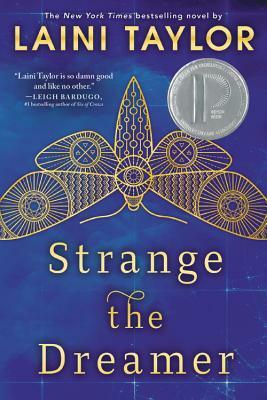 In her latest book, Strange the Dreamer, Oregon Book Award winner Laini Taylor has created a vivid world, a chilling power dynamic, an unexpected love story, and a cast of characters that will live in your heart long after the last page. Young Adult. It's so easy to fall into Laini Taylor's worlds. Her imagery is vivid and poetic and her characters are fascinating. Highly recommended! The dream chooses the dreamer, not the other way around--and Lazlo Strange, war orphan and junior librarian, has always feared that his dream chose poorly. Since he was five years old, he's been obsessed with the mythic lost city of Weep, but it would take someone bolder than he to cross half the world in search of it. Then a stunning opportunity presents itself, in the form of a hero called the Godslayer and a band of legendary warriors, and he has to seize his chance or lose his dream forever. What happened in Weep two hundred years ago to cut it off from the rest of the world? And who is the blue-skinned goddess who appears in Lazlo's dreams? Laini Taylor is the New York Times bestselling author of the Daughter of Smoke and Bone trilogy: Daughter of Smoke & Bone, Days of Blood & Starlight, and Dreams of Gods & Monsters, and the companion novella A Night of Cake & Puppets. She is also the author of the Dreamdark books Blackbringer and Silksinger; the National Book Award finalist Lips Touch: Three Times; and Strange the Dreamer. She lives in Portland, Oregon, with her husband, illustrator Jim Di Bartolo, and their daughter Clementine.